Welcome to the Sunderland Football Shirts and Accessories shop at Soccer Box. This is the place to look if you are shopping for Sunderland football shirts, accessories and merchandise. 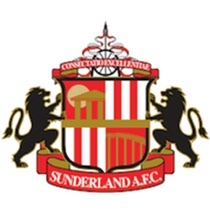 Sunderland AFC is an English League football club that was founded in 1879. Over the years they have had periods of success, winning the top-flight of English football on 6 occasions. Their last big win came in 1973 when they won the FA Cup. The team is most popular in Northern of England where the fans enjoy a tempered rivalry with neighbours Newcastle United. The Sunderland football shirts are a popular choice for fans. The clubs home ground, The Stadium of Light, is swamped with supporters proudly wearing their Sunderland football shirts during every home game. The Sunderland football shirts and accessories store contains a great range of team merchandise available for you to order today! The Stadium of Light has been the Sunderland team’s home ground since 1997. This stadium is the focus of attention for fans. The stadium can hold up to 49,000 fans, many wearing the Sunderland football shirts on match day. As well as the shirts thousands of fans can be seen with Sunderland football accessories and merchandise designed for showing team pride. The famous red and white stripes have been used in the design of the Sunderland football shirts since 1887. These now iconic stripes not only adorn the football shirts but also feature in the Sunderland football merchandise and accessories that are available for keen fans. The Stadium of Light is all decked out in red and white adding to theme on match days, with the fans wearing their shirts and sporting various accessories showing that they are supporting the Black Cats. Football accessories are a great way of showing support for a particular team. At Soccer Box you can find a selection of Sunderland football accessories that are perfect for showing your support every day. The Sunderland football shirts are great for wearing at the match or at the weekend. Sunderland football merchandise can be incorporated into every day use. Sunderland football accessories include mugs, hats and scarves that can be used at home, school or work for showing your football support. Shopping for Sunderland football merchandise is also a great gift idea for any fan of the Black Cats. Sunderland fans are loyal and proud, they wear their shirts with pride and are keen to show support and solidarity at every opportunity; merchandise and accessories are a fantastic way of showing support. The Sunderland football shirts and accessories shop at Soccer Box is the place to shop for all Sunderland merchandise. If you are looking for shirts and accessories for other Premier League football teams Soccer Box is the number 1 choice.